European evening news, which in Germany, the UK, France and the Low Countries usually is brought on at 7 or 8pm, all opened with the same headline: Swedish elections. Yes, that great was the interest of the rest of the developed economies of the ‘old continent’ to see if the nationalism versus liberalism fight which has seen the right-wing parties win every major election in Europe in the past two years would continue. 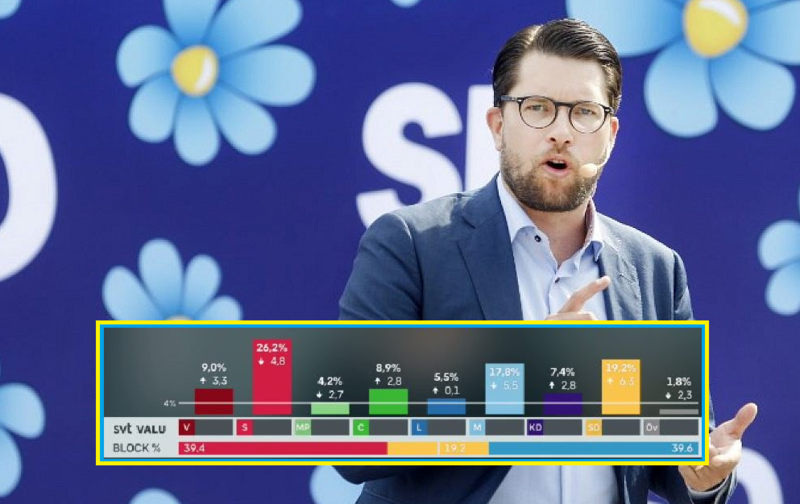 In summary, Europeans wanted to find out if left-leaning liberal Sweden would give a large share of its vote to an anti-immigration party known as the Sweden Democrats. Related coverage: <a href="http://thegoldwater.com/news/36459-Sweden-Elections-PM-Warns-Of-Extremism-And-Fascism-On-Last-Campaign-Day-Video"> Sweden Elections – PM Warns Of ‘Extremism And Fascism’ On Last Campaign Day (Video)</a>. The result came in the form of an exit-poll (with a probably accuracy of around 3%), released on Swedish commercial broadcaster TV4 at ten minutes to 8 and a bit later one on national broadcaster SVT at 8pm sharp as the voting booths closed. Scandinavian efficiency. The Sweden Democrats of Mr Jimmie Akesson (pictured), who vowed to ‘clean up the northern country’ should he be allowed to govern, gained the most with 7% rise since last time, with the Swedish voters offering him 19% and turning the anti-immigration party to the second biggest party in the country. The ruling centre-left Social Democrats of PM Mr Stefan Lövfen remain the largest party, although their vote share is now the lowest for 100 years with 25%. As expected, it is the centre-right conservative Moderate Party, headed by Mr Ulf Kristersson who will be the probable kingmaker with 17% of the vote. Able to rule with either the left (although he would not be guaranteed the PM position), leaving the Sweden Democrats to win even bigger if he doesn’t tackle the crime and immigration issues that have taken centre stage by the next election, or, like in Austria, rule with the right-wing Sweden Democrats (who will likely hand him the premiership for a chance to rule) and end Sweden’s immigration program.